Baker's position on climate change has evolved since his unsuccessful 2010 run for governor. At that time, he told The Boston Globe newspaper he was "not smart enough to believe that I know" whether humans were responsible for global warming. It’s minus eight degrees Celsius on a late winter morning in western Massachusetts. But electrician Ed Martell is on the job, helping build an 8,000-panel solar farm outside the town of Wales, 110 kilometers southwest of Boston. Martell says solar installations have been going nonstop for the past several years. Although sunshine is not the first image that comes to mind in connection with Massachusetts, policy decisions have propelled the state to third place nationwide in solar jobs, behind sunny California and Florida, which is known as the Sunshine State. Martell says the industry has been growing at a time when there has not been much other work for electricians. 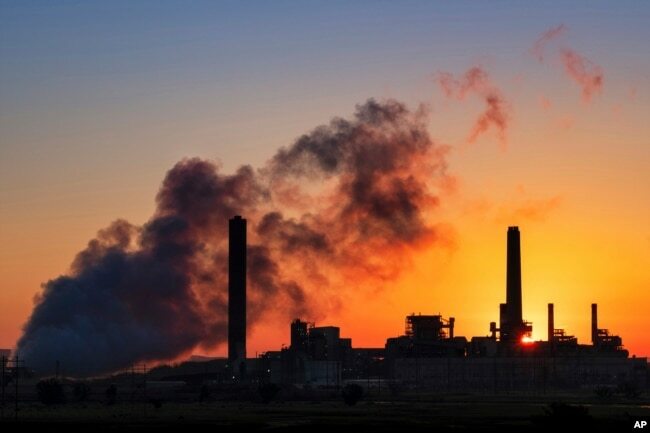 As the planet heats up, experts say the world needs to stop burning the fossil fuels that have powered civilization for centuries and switch to energy sources that do not release greenhouse gases that drive up the Earth’s temperature and produce weather extremes. The transition will not be easy. There will be winners and losers, economists say. The smokestack and the rusting remains of the 1960s-turquoise turbine are the last identifiable remains of the Mount Tom Station coal-fired power plant located 145 kilometers west of Boston in Holyoke, Mass. Former maintenance engineer Clancy Kaye kept the plant running for more than 30 years. But between expensive environmental upgrades, the plunging price of natural gas, and concerns from neighborhood groups about climate change and air pollution, the plant’s owners pulled the plug in 2014. They then built one of the largest solar farms with battery storage in New England just down the street. Eighty people worked at Mount Tom at its peak. When it finally closed in 2014, the number was down to 28. Some of them retired. The company offered a generous severance package, Kaye said. But about a dozen employees had to take other jobs with 30 percent to 50 percent pay cuts and fewer benefits. “It’s been really a very rude awakening for many people who used to make some very good money. And some very highly skilled people,” Kaye said. More than half of the 530 coal-fired power plants that were running in 2010 have shut down or plan to by 2030, according to the Sierra Club, an Oakland, California-based environmental group. There have been losses in Massachusetts. But experts say the state’s policies to fight climate change have created more winners. While Congress and the White House have feuded for years about what, if anything, to do, Republican and Democratic leaders in the Bay State have taken innovative steps to reduce greenhouse gases. In 2008, Massachusetts was among the first U.S. states to set a greenhouse gas reduction target. By mid-century, the state aims to have cut emissions by 80 percent below 1990 levels. Accompanying legislation requires utilities to buy increasing amounts of renewable energy and charges power companies for carbon pollution. The state created aggressive programs to promote energy efficiency. “Some detractors did say that this is going to turn the economy upside down, this is going to cost people more,” said Mark Sylvia, former Massachusetts energy resources commissioner. With a clear signal from the government, the market responded. Clean energy is now a $13 billion industry in Massachusetts. Its workforce has grown 84 percent since 2010. The sector now employs more than 110,000 workers, three percent of the state’s workforce. In Washington, the climate debate is polarized between Democrats calling for an end to fossil fuels and Republicans saying these proposals will destroy jobs, when they acknowledge the problem at all. Only recently did Senate Majority Leader Mitch McConnell of Kentucky acknowledge that human activities are responsible for climate change. But Massachusetts’ Republican Gov. Charlie Baker took over from a Democrat, Deval Patrick, and held firm on climate policy. “In Massachusetts, climate change is not a partisan issue,” Baker told the House of Representatives Committee on Natural Resources in February. Baker noted that since he took office in 2015, the state has suffered damage from record snowfall, record storm flooding and record drought. Rising temperatures have hurt the state’s winter sports industry and fisheries. “While many of these challenges are not new, they are more frequent and more damaging than ever,” he said. 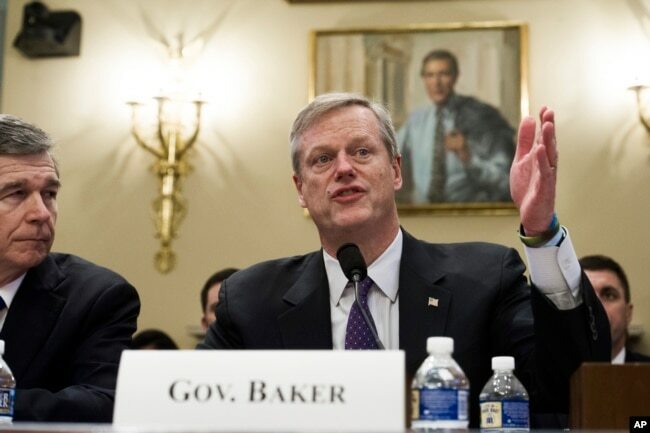 Baker’s position on climate change has evolved since his unsuccessful 2010 run for governor. At that time, he told The Boston Globe newspaper he was “not smart enough to believe that I know” whether humans were responsible for global warming. But in his testimony, he called for a federal target for greenhouse gas emission reductions, a proposal congressional Republicans have repeatedly rejected. He noted that since the state set its target in 2008, “far from being an economic burden, we have seen close to a 70 percent increase over 1990 levels” in the state economy. Baker recently rolled out an updated incentive program for solar power and is planning major offshore wind installations that are expected to create 3,600 local jobs. And to pursue the jobs of the future, the state has provided more than $2 million in loans and grants to Greentown Labs, a business incubator for startups working on clean technologies. The growth will not help everyone, however. In the power generation business, “if you want to know where the jobs are, take an aerial view of the parking lot,” said Donnie Colston, head of the utility department at the International Brotherhood of Electrical Workers. A coal plant may have 150 to 200 cars in the lot, Colston said. But a solar farm? No parking lot. Environmentalists pushing to close coal-fired power plants are sympathetic to the threat of lost jobs. From freshman Rep. Alexandria Ocasio-Cortez of New York to local Sierra Club chapters, activists are calling for a “just transition” for displaced workers in fossil fuel industries — job retraining and other measures to cushion the blow. But the workers don’t want to hear it. Massachusetts closed its last coal-fired power plant in 2017. While the transition has been hard on many of his colleagues, Kaye is not bitter. He started a pool installation company that’s expanding. He said he always knew the plant wasn’t helping the environment. And change happens. "Recycling just one tonne of paper can save 17 trees, 7,000 gallons of water, 380 gallons of oil, 3.3 cubic yards of landfill space and 4,000 kilowatts of energy"